A 30-year-old man has been arrested over the murder of Tanesha Melbourne-Blake, 17, in Tottenham, Scotland Yard have said. 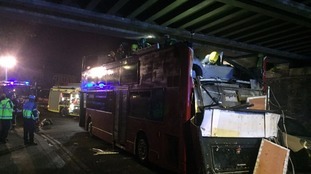 26 people injured and five people were taken to hospital after a bus crashed into a railway bridge. The RSPCA wants to reunite a lost cat with his owner after he was taken 60 miles from Tottenham inside the engine of a removal van. A north London backpacker died when the quad bike she was riding turned over and crushed her on an Australian beach, an inquest has heard. Russian state media has been ridiculed over claims of no-go 'explosive ethnic neighborhoods' in London. A man has been treated for smoke inhalation and 12 people were evacuated after a fire broke out above a petrol station in Tottenham. Four fire engines and 21 firefighters were sent to the petrol station in White Hart Lane just before 8.30am this morning. Firefighters said they "isolated" the petrol pumps but part of the first floor was damaged by fire. Tottenham-born singer Adele has been announced as one of the headline acts for this year's Glastonbury festival. A woman who has been charged with murder is set to appear in court later, Scotland Yard has confirmed. Gyuldzhan Hadzhieva, 37 of Northumberland Park, Tottenham is to appear in custody at Hendon Magistrates' Court. She has been charged with the murder of 32-year-old Shenol Erol Ali at Northumberland Park on Wednesday, February 3. A man has been found dead and a woman with multiple life-threatening injuries in a flat above a pub in north London.